chance your eye will be dilated. I know this is obvious, but sometimes you may get prescribed drops with a dilation effect for more than just a routine dilation at your doctor's office. If you were prescribed atropine, homatropine, scopolamine, cylcopentolate, or tropicamide, then you are taking a dilating eye drop. Atropine may be prescribed during amblyopia treatment as a type of "patch" for the good eye. Homatropine (which is no longer available) and now cylcopentolate are often prescribed during severe uveitis to prevent iris inflammation from closing off the pupil. It can also be used for a pain reliever effect during treatment for corneal abrasions or accommodative spasms. If you see a red cap on your eye drop, it is probably going to have a dilation effect. Going on vacation? Scopolamine patches are incredibly effective at knocking out motion sickness, but a dilated pupil on the same side you were wearing the patch is a common side effect. The dilation usually goes away within a few hours after removing the patch. Dilated pupils? Visine is the usual suspect. This is the most common dilation offender in my experience. 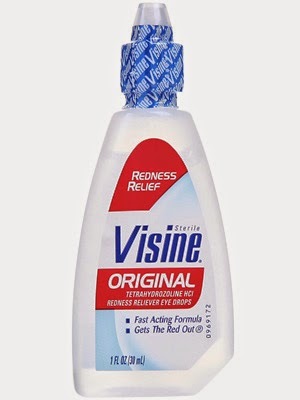 Visine, Clear Eyes, and other "red eye" drops lessen the appearance of redness (temporarily) by constricting the diameter of the blood vessels on the white of the eye. As a side effect, you can also induce a dilation. If you stop taking the drop, the dilation effect should slowly wear off. Some homeopathic eye drops or home remedies can also have these side effects. If you see anything in the ingredients about belladonna extract, a dilation side effect is likely. If you are taking oral sinus medications, there is also a low risk of a dilation side effect. Oral decongestants that contain phenylephrine are a well-known possible offender. Phenylephrine is commonly used in your eye doctor's office to dilate your eye, so a dilation from oral phenylephrine is not all that uncommon. This is probably the least likely culprit, but certain plants (belladonna was mentioned already) can cause a temporary dilation by coming into contact with their leaves and then touching around the eye. 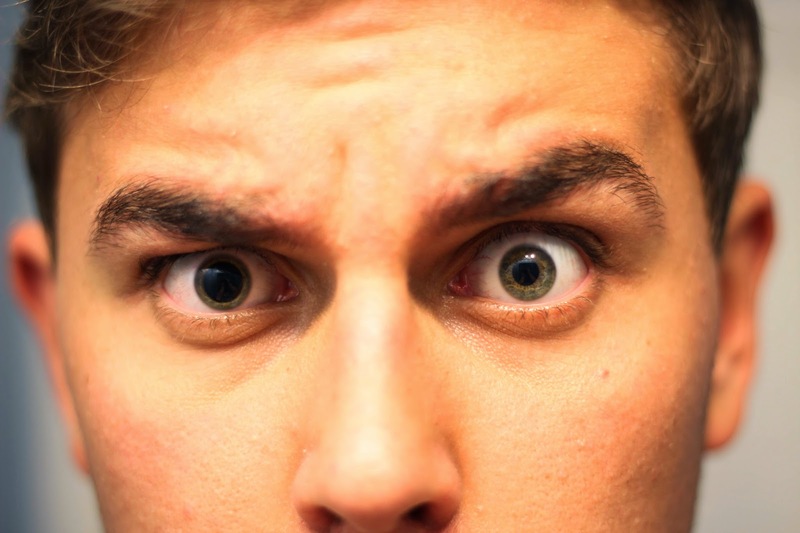 What to do if your pupil is dilated? Take a deep breath, and then ask yourself a few simple questions. 1) Can you see clearly in the distance? If your pupil is truly dilated, then it is perfectly expected for you not to be able to see well up close. 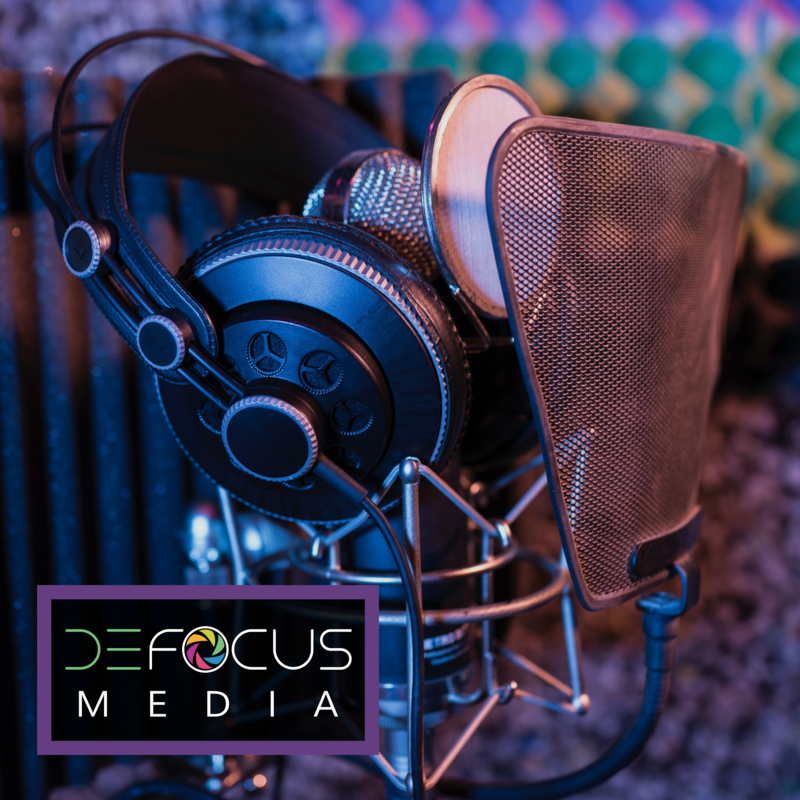 Dilation means that the eye muscles of the iris are relaxed, and if they can't constrict to close the pupil, you likely can't use your eye muscles to focus on near objects either. But unless you are highly far sighted, your distance vision should feel relatively normal with your glasses or contact lenses on. If your vision is totally dark, severely blurry at all ranges, or you are seeing floaters or flashing lights in your vision, then call your eye doctor immediately. Other suspicious symptoms like one sided weakness, double vision, inability to move the eye in all directions, inability to open or close the eye, or a spike in blood pressure or blood sugar levels all necessitate immediate medical attention! 2) Do you feel any pain? A dilation will cause you to feel more sensitive to bright lights, but it should not be sharply painful at all. If you feel sharp or throbbing pain, or nausea, then please call your eye doctor immediately. You may be experiencing a severe spike in your internal eye pressure which needs immediate treatment. 3) Have you been using any medications or eye drops? 9 times out of 10, you used Visine earlier that day. 4) How long has your eye been dilated? If you have a medication or external-induced dilation, and you stop the medication, then the dilation should typically wear off in a few hours. Scopolamine, homatropine, or atropine dilation effects can last much longer however. In someone with light or blue eyes, an atropine-induced dilation could take several days to a week to completely wear off. The important part is that a medication induced dilation will always go away, eventually. A medical condition causing a dilated pupil isn't going anywhere. 5) Have you suffered any injuries or trauma? Concussions are commonly associated with dilated pupils. If you had a recent fall or head injury, and now have a dilated pupil, please go to the hospital. A dilated pupil can be something very serious, so it is always important to seek medical care, especially if you have any of the associated symptoms listed above. I would suggest always triaging a blown pupil with a doctor instead of trying to self-diagnose at home, but hopefully this post helps put you more at ease if you notice a dilated pupil after using a few drops of Visine. Woild the smell of ethanol for a period of 5 to 6 hours while working on a gasonline leak and getting punched in the head (resultibg in a black eye )multiple times the night before result in possiblility of small pupils? Similiar to methamphetamine use? Injuries and exposure to chemicals can all cause changes to your pupils! Definitely get this checked out by an eye doctor!